El Dynamito! SHOT has burst from its VHS grave thanks to the restorative efforts of collector’s label Vinegar Syndrome and the agreeability of its writer/director, Mitch Brown, and producer, Nate Kohn, who could have easily buried their student magnum opus for good. It is by no means a stellar example of cinema or an important note in the history of movies, but SHOT has always registered with us at C-U Blogfidential as a particular blip on the local timeline that signified a little something ahead of its time. While viewing the new Blu-ray release derived from a 2K scan, we can marvel at not only its miraculous existence but also its ambition, given that it is an amateur production filled with plentiful action set pieces and cheeky spins on then-common Hollywood tropes and trends. The film doesn’t really have a direct correlation to anything that came after it in Champaign-Urbana or at the University of Illinois, even with Kohn’s later participation in Cyberfest and Roger Ebert’s Film Festival, but it is a fascinating piece of feature-length storytelling rendered on Champaign County soil well before all the comparable efforts produced here in the last 20 years. 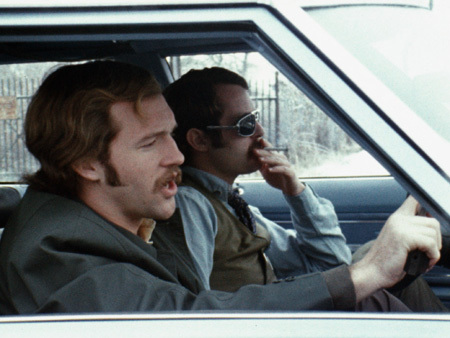 A much younger Brown and Kohn and their peers took SHOT seriously enough to acquire props and gags, purchase and repaint stunt cars, secure locations, cast age-appropriate actors, hire both an experienced cinematographer and sound recordist, and draft a shooting script with unabashed market salability, in this case the “flawed cop/corrupt system” angle hitting its peak with the likes of DIRTY HARRY and THE FRENCH CONNECTION. Even if they did crib mercilessly from the genre box-office hits of the day, the crew behind SHOT took advantage of the Champaign-Urbana surrounding them. Country roads, rail yards, community parks, and the Champaign County Fairgrounds provide a weathered Midwest expanse in which the drama can play out, while college-friendly businesses no longer serving C-U like Mr. Quick and Chicken Unlimited make fun appearances. Nothing distinct on the UIUC campus is visible or identifiable except for the easily accessible like an odd façade or parking garage; we’re certain much was avoided on purpose to affect a “bigger city” atmosphere. Location selection plays a big part in making SHOT feel much more grandiose than its $15,000 budget might have otherwise allowed. 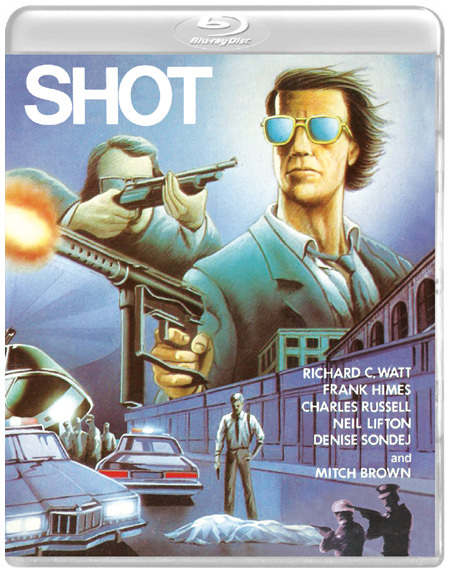 Despite the dated attitudes of certain characters, fair-to-stilted acting, and subplots that are snuffed out as carelessly as some of the drug runners defeated by Ross (Richard C. Watt) and Wilson (Charles Russell), SHOT is an entertaining throwback. We do wonder what unsuspecting renters might have thought of it back in 1987, when Sony Video Systems originally put it out on VHS and Beta as DEATH SHOT, or how much of a Big Thing it was considered when Kohn, Brown, and their Cinemaguild campus club premiered it at Foellinger Auditorium in 1973. 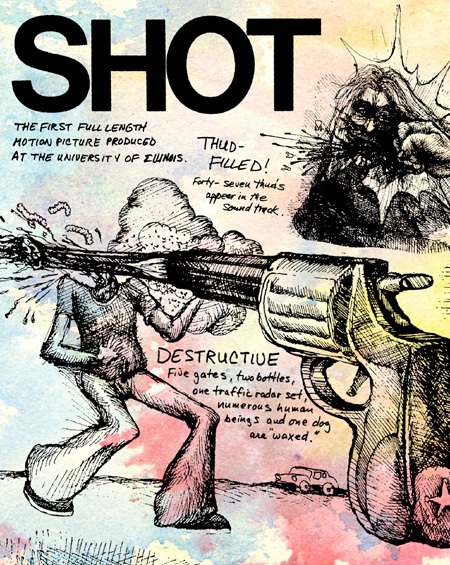 That is the past, however, and as of yesterday, Tuesday, August 28, Vinegar Syndrome’s Blu-ray/DVD combination package will introduce SHOT to a mostly new audience that might be more receptive to a curio like this in our pop-culture friendly climate. SHOT was shot full-frame, maybe not surprising since camera man Rod Adrian worked for the university’s documentary production unit, so it is presented with letterbox-style blank spaces on the sides. The footage looks as grainy and simply lit as one might expect from a student 16mm project, yet it only adds to the aesthetic. 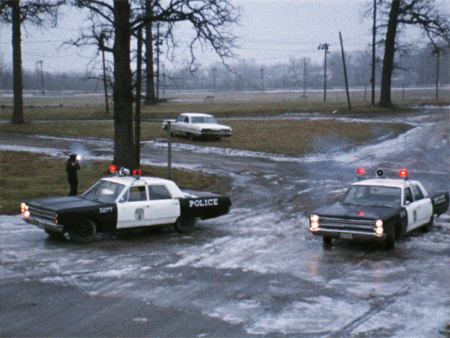 Bold or primary colors pop drastically against the gray and brown drabness in nearly every scene – filming took place in the winter of 1972-73, again providing ready-made production design on a dime – and the sound is a clear mono track that emphasizes dialogue and “thuds” over nuance. This includes the jaunty instrumentals performed by Nashville group Area Code 615 such as “Scotland,” which is heard in the trailer and runs under the main titles. The 92-minute run time on the new transfer is slightly longer than the edit on the VHS, differences most likely due to Sony cutting for time so the film fit on a 90-minute cassette. 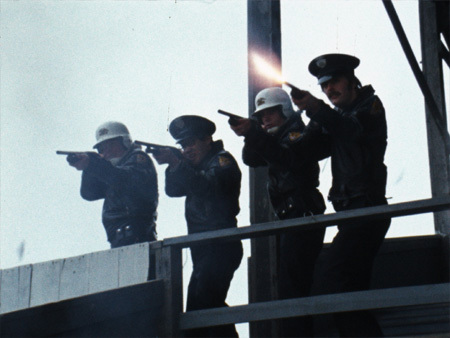 We only found three distinct bits restored in the Vinegar Syndrome print: a longer framing of gang leader Blasi’s (Frank Himes) toadies peering into Mr. Quick, a few seconds of chit-chat between Blasi and smarmy politico Mark Chambers as they have drinks at a pavilion, and a fun (if poorly paced) opening scene where live wire Ross arrests a joint-smoking film buff played by the late Edwin Jahiel, a UIUC professor in French, comparative literature, and cinema studies. As the film is scanned from a master reversal print, we can presume the 102-minute length touted in vintage Cinemaguild promotions is an honest mistake or deliberate myth. Bonus materials are modest when compared to other boutique releases but at least they provide viewers with interesting backstory. A video interview with Brown and audio interview with Kohn, each lasting about 23 minutes, walks us through the making and barely-there distribution of SHOT, a calling-card film that was funded through Cinemaguild’s omnipresent film bookings on campus. A brief slideshow presents much of the film’s coverage and advertising in the Daily Illini. Removable subtitles are easy to read. Since we have not seen otherwise, everything presumably appears on both the Blu-ray and DVD discs. A sturdy and embossed slipcover is adorned with “hippy” comic art taken from those ads while a reversible sleeve features this art and VHS-era artwork from Spain. SHOT is a raggedy cop show romp that is episodic and often aimless, yet it moves along briskly and is agreeable viewing along the lines of a late-night discovery on television. (Don’t laugh. It still could happen. Turner Classic Movies has broadcast Vinegar Syndrome titles as weekend overnight fare.) In fact, it might be the closest thing we have to a Champaign-Urbana cult film if only a cult had actually formed around it. Maybe that will still transpire in the future if streaming rentals and retrospect bookings open up its 45-years-late exposure. (Don’t laugh. You can now rent it for theatrical screening through American Genre Film Archive.) For the moment, purchasing directly through the Vinegar Syndrome Web site or other on-line retailers is the shot in the arm this SHOT legacy needs. Below we have shared the label’s information for the home video. All graphics and screen shots are courtesy Vinegar Syndrome. p.s. One way that Vinegar Syndrome rewards its fan base is to offer year-long subscriptions of their titles and month-by-month presale deals at a great discount. Your humble editor couldn’t afford their August set apart from SHOT but we’ll plug the other releases anyway: DEAR DEAD DELILAH, a Southern Gothic murder mystery from 1972 that stars Agnes Moorehead and is directed by novelist John Farris (The Fury), and WONDER WOMEN, a 1973 sci-fi action mish-mash filmed in the Philippines by director Robert Vincent O’Neil that features Nancy Kwan, Ross Hagen, and Sid Haig. p.s.2 Hagen’s other 1973 release is the crime comedy mish-mash BAD CHARLESTON CHARLIE, which is also the other Champaign-based indie production from the first half of the Seventies. Unlike SHOT, CHARLIE seems to not have any 21st century champions as it lingers in post-VHS limbo. Semi-urban detective duo Ross and Wilson have been charged with taking down local drug kingpin, Blasi. After busting a low-level pusher, they convince his girlfriend, Sheila, to start working for them as an undercover operative in exchange for avoiding prison. But as Ross finds himself becoming romantically interested in his new, perpetually spaced-out informant, Blasi continues to strengthen his crime empire, setting his sights on even loftier, and deadlier, ambitions. A low-key piece of regional New American Cinema influenced action-thriller and character drama, SHOT was produced for a scant $15,000 in the college town of Champaign, IL and is made all the more impressive by the fact that it was written, produced, and directed by then-college students Mitch Brown and Nate Kohn, using funds they’d raised doing campus film screenings. 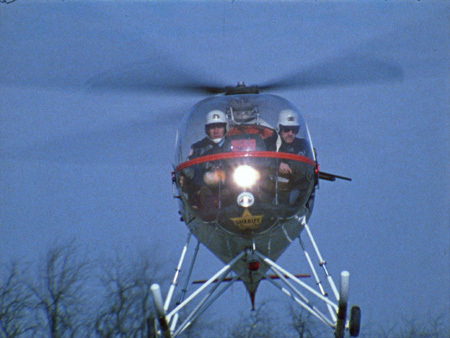 With its well-choreographed and FRENCH CONNECTION-inspired char chase and stunt scenes, impressive helicopter photography (and pursuits), punctuated by naturalistic performances from a mostly amateur cast, along with extensive local color, SHOT remains a forgotten gem of early ‘70s regional filmmaking. 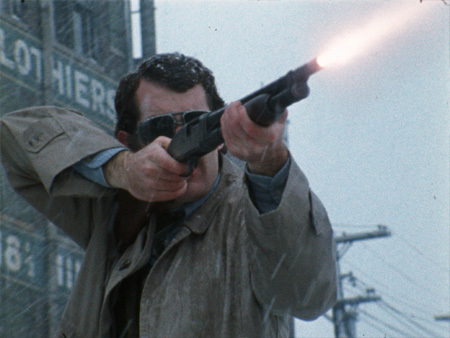 Barely screened theatrically and almost impossible to see since its brief VHS release (in which it was retitled DEATH SHOT), Vinegar Syndrome presents SHOT on Blu-ray, newly restored from its 16mm reversal original and fully uncut for the first time on video. This entry was posted on Wednesday, August 29th, 2018 at 3:00 pm	and is filed under Critique du C-U, Home Videos du C-U, Images du C-U, Ones That Got Away?, Preservation, Student Film, The Old School, Videos du C-U. You can follow any responses to this entry through the RSS 2.0 feed. Both comments and pings are currently closed. 14 distant relations of Jan Tschichold dissected this page in 0.378 seconds while exacting sweet revenge in silence.